The Aikaterini Laskaridis Foundation is proudly organising the 5th Transnational Meeting Multiplier Event on Thursday, 9 February, 17.00-20.00, at its Historical Library in Piraeus [2as Merarhias 32 str. 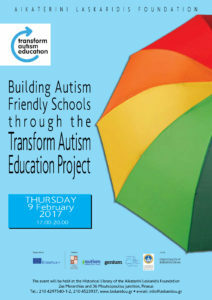 ), and it is entitled Building Autism Friendly Schools through the Transform Autism Education Project. The Multiplier Event will have international participation as it is embedded in the program Transforming Educational Practise in Autism which runs in Greece in cooperation with the University of Birmingham (UK) and of Milan (Italy). During the event, the results of the three year implementation of the program in Greek schools will be disseminated for the first time through the papers of the foundation’s Vice-President, Katerina Laskaridis, and also of other renown psychologists, mental health specialists, teachers and school directors.